Welcome to the 10100111001est (that's 1337est in binary ;-)) blog in the world! You guessed it, it's a geek blog! This blog will be a source for people like me who want to create cool things, but don't have a clue about where to start, and ultimately, inspire them to create even more mind-boggling projects! What does each of the 9 pins do? Which pins do I actually need? What will my cable look like? What does the signal coming from the data pin look like? 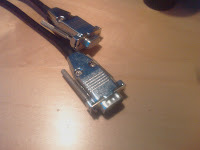 Used by modem to signal that it is connected to a working phone line. Local device receives data sent from the other device. Local device transmits data to the device at the other end. Local device sends a signal that it is ready to transmit. Remote device signals if it's ready to transmit. Local device requests if remote device is ready to receive data. Remote device acknowledges that it's ready to receive data. Used by modem to indicate that it has detected a ringing signal on the phone line. Well, since my IC is not a modem, I am not going to use pins 1 and 9. My IC does not send feedback, so that excludes pin 2. So far, that leaves pins 3 – 8. Let's examine pins 4 and 6 a little closer: pin 4 sends a signal out that to tell that it's ready to transmit, and pin 6 is waiting for an incoming signal which means the other device is also ready to transmit. 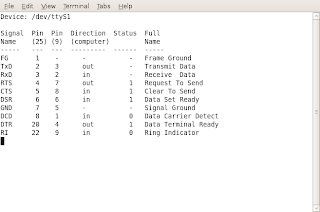 The IC is ready to receive data at any given time, so I will connect pin 4 to pin 6, which in fact tells the port that it's ready to transmit as soon the computer itself is ready. I also will connect pin 7 to pin 8 (check out the table to see why that is). Pin 5, I will leave this pin unconnected, since my IC is already grounded at another point. And last but not least, the Transmit Data pin (#3) will be used to send data to the IC. 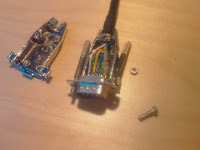 Side note #2: on Ubuntu, I used the program “statserial” to inspect the idle state of my serial port, when my connector was connected. The question remaining here, is how does the signal (or wave) coming from the TD pin look like? I will be going into more detail about this in my next post. Stay tuned! Hi! I started my first year of Computer Science at the Delft University of Technology in The Netherlands in 2008. Whenever I find spare time, I work on a project I think is cool :-) This is my blog and I want to share my experiences and inspire you to invent and share with other people aswell!